Enjoy over 100kms of scenic driving before arriving at Gostord Classic Car Museum. Starting point is Cowan Rest Area Truck Stop (Old Toll Gates Berowra). Join us for a lunch drive to Gosford. We will be driving through over 100kms of road with sweeping curves and breathtaking views through Galston Gorge, Peats Ridge and Yarramalong Valley. 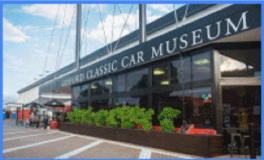 Our first stop will be the Gosford Classic Car Museum. Home to over 400 classic and new cars (even a few motorbikes), the Gosford Classic Car Museum has certainly put itself up there as one of the world’s biggest private car collections, with an endless collection of marques such as Ferrari, Mercedes-Benz, Porsche, Chevrolet and even lesser known marques like Jensen, Tatra and Lada. After our visit to the Museum, we will proceed to The Coast Bar and Restaurant for a delicious two course lunch. This restaurant is on the waterfront, perfectly situated and perched over Brisbane Waters. It promises a great dining experience. To ensure you are not disappointed, please book early as numbers are limited. *Please note that Museum entry fees are to be paid separately at the door. Entry fees are $17.50 pp. Please call Mavis Anderson on 0418 267 873 if you have any queries.